Israel is a young country, and cinema is a young art form. But the relationship between Israeli cinema and its establishment has often been an uneasy one. Nonetheless, the history of Israeli cinema mirrors the history of Israel itself. One of the first-ever motion pictures was filmed in Ottoman Palestine by the French Lumiere brothers. It is known popularly as Train Station in Jerusalem (1896). Its exotic, panoramic views are as transfixing today as when they were first screened for a European audience. Eretz Yisrael (the Land of Israel) itself remained the focal point of filmmakers through the period of the British Mandate. 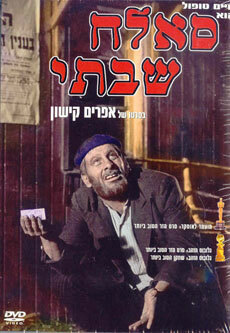 The first feature-length film in Hebrew was Oded the Wanderer (1933). It depicts a young sabra [Jew born in the land of Israel] who gets separated from his classmates on a school trip. In a typically didactic effort, the film emphasizes the importance of working the land and restoring a Jewish connection to it. Most productions made during the years before and the first years of Israeli statehood, stressed these and other Zionist ideals. A common trope was the heroism of the Jewish pioneers, not just in settling the land, but also in fighting for their survival. The most prominent Israeli manifestation of this type is probably Hill 24 Doesn’t Answer (1955). Filmed with a relatively expensive budget, it tells the stories of four fighters from diverse backgrounds in the War of Independence. They die, but their deaths are not in vain–their mission is accomplished and the eponymous hill is awarded to Israel. Ephraim Kishon’s first movie, Sallah Shabbati (1964), is radically different from these standard productions featuring heroism, nobility, and sacrifice. It shattered all box-office records and is still shown frequently in ulpanim [Hebrew-language training] in Israel. Sallah hilariously subverts the self-important idealism that was so pervasive both in Israel and in Israeli films. It was nominated for an Academy Award, and stars Haim Topol as a Sephardic immigrant [that is, a migrant from Mediterranean lands], lazy and endearing, who manipulates the system for his own advantage. The late ’60s saw the emergence of a new force in Israeli cinema, the so-called Kayitz (in Hebrew, an acronym for Young Israeli Cinema) group. The French nouvelle vague–New Wave–movement and its concept of the auteur had begun filtering through to Israel. Developments in cinema were also running parallel to developments nationally, as the  Six-Day War changed Israel’s view of itself. Israelis were bored with the Zionist fables, and were less worried about imminent destruction. However, there was no context in which to place the cinematic innovations as there was elsewhere. In literature, there was an uninterrupted tradition going back thousands of years, and writers were able to draw on a rich heritage to lend resonance and context to their work. In film, forging a modern native tradition with artistic integrity proved more difficult. Uri Zohar’s Three Days and a Child (1967), based on a short story by A.B. Yehoshua, garnered Oded Kotler the Best Actor Award at the 1967 Cannes Film Festival. It is a psychological drama, which explores the ambivalence of a man during three days when he baby-sits the son of his ex-girlfriend. It strives, in ways the story does not, to normalize life in Israel and the existential dilemmas faced by its citizens. However, this very effort makes it less successful than the work by Yehoshua, who knows that nothing universal can arise without attention to the particular, and that Jerusalem is not Paris. Despite its lack of complete success, the film is of seminal significance in its effort to project a fully realized artistic vision onto the screen. The ’70s saw the ascendancy of the so-called “bourekas films.” Many Israelis looked to these home-grown farces (and some melodramas) for an escape from the tension of their lives. In no way sophisticated, and as unpretentious and insubstantial as the pastries that gave them their name, these bourekas films fit the bill. Finally, in 1978 the Fund for the Encouragement of Quality Israeli Cinema was established. Not coincidentally, the second wave of Kayitz filmmakers emerged in the late ’70s and early ’80s. One of the most important members of this generation is Uri Barabash, whose made-for-television drama, My First Sony, is being screened at the Israel Film Festival. His work deals with issues like mental illness, the rehabilitation of criminals, and the pressures of basic training. His most well-known film is Beyond the Walls (1986), which deals with Arab-Jewish relations in a prison and was nominated for an Academy Award. In the 1990s, Israeli cinema came of age in many ways. The expanded population and economy, along with a less defensive, insular perspective of Israeli society, have contributed to an explosion in both the quantity and quality of films. Many Israelis stopped going to domestic films at the time of the bourekas movies, and continue reflexively to avoid local productions. Others see all films as ambassadors, and thus want them to represent Israel in the best light possible. Unsettling is an understatement for the situation in Israel today. What course even the immediate future will take is uncertain. There are explosive, rival visions of the character and nature of the state. These conflicting views have the potential to provide fertile nourishment to a film industry that is increasingly gaining respect, both at home and abroad. As Israel continues to mature, we can only wait and see what form Israeli cinema will take as it matures too. Increasingly trendy worldwide, Israeli food mixes the flavors of the Middle East and the Jewish Diaspora.